Welcome to the Raspberry Pi and mobile application resource section. In this section, you will find various resources to get started developing mobile applications to interact with your Raspberry Pi projects using Evothings Studio. 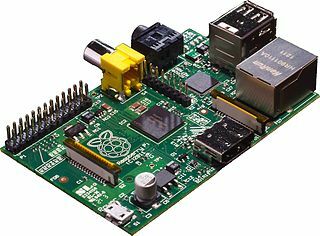 The Raspberry Pi (pictured) is based on the Broadcom BCM2835 system on chip (SoC) that includes an 700 MHz ARM processor, in-built GPU and 256 or 512 megabytes of RAM (depending on model). The system has Secure Digital (SD) or MicroSD memory card sockets for the operating system or persistent storage and is capable of running full Linux distributions or be configured as a barebone environment. Below are a number of resources on our website to support getting started with developing mobile apps using Evothings Studio. Enjoy discovering a new world of possibilities combining your Raspberry Pi projects and mobile applications! Controlling a toy car with Evothings Studio, Raspberry Pi and your mobile device.